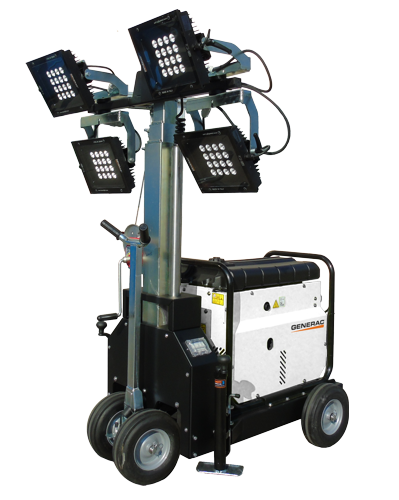 The MT2 is a brand-new lighting tower equipped with 4x185W high efficiency LED floodlights. It’s one of the smallest mobile lighting towers of the Generac Mobile® range. The MT2 can be equipped with two different build-in generating set: 4kVA Yanmar diesel-driven or 5kVA Honda petrol-driven. Thanks to the practical manual hand trolley and the light weight, a single operator can handle the MT2 quickly and safely in every kind of working area.